Bring the warmth and ambiance of your living room to the outdoors with the addition of this grand outdoor fireplace. Featuring a complete 360 view of the fire bowl, ensuring that nobody gets left out in the cold. Metal grating all around the fire bowl ensures that the embers and sparks stay in the bowl where they belong and a large access door makes tending to the fire a cinch. The functional chimney top will funnel smoke up and away from your gathering and reduce the amount of irritating smoke in your eyes. Comes in a beautiful antiqued finish to give the whole piece a weathered look, rich with character. Made out of durable steel this piece is sure to last for seasons to come. The Toulouse is a decorative tabletop fire feature that is designed for both indoor and outdoor use. It creates a beautiful soothing flame. This tabletop will burn for approximately 3 hours with 1 fill of superior quality bio ethanol fuel. Included in the box is one 32oz bottle of superior quality bio ethanol fuel, tempered safety glasses, a snuffer and an easy pour spout. This unit comes with a 3 Year Manufacturers Warranty. The glass can be custom engraved with any design or logo. Louise Wood/Charcoal Outdoor Fireplace Bring the warmth and ambiance of your living room to the outdoors with the addition of this grand outdoor fireplace. Featuring a complete 360 view of the fire bowl, ensuring that nobody gets left out in the cold. Metal grating all around the fire bowl ensures that the embers and sparks stay in the bowl where they belong and a large access door makes tending to the fire a cinch. The functional chimney top will funnel smoke up and away from your gathering and reduce the amount of irritating smoke in your eyes. Comes in a beautiful antiqued finish to give the whole piece a weathered look, rich with character. Made out of durable steel this piece is sure to last for seasons to come. 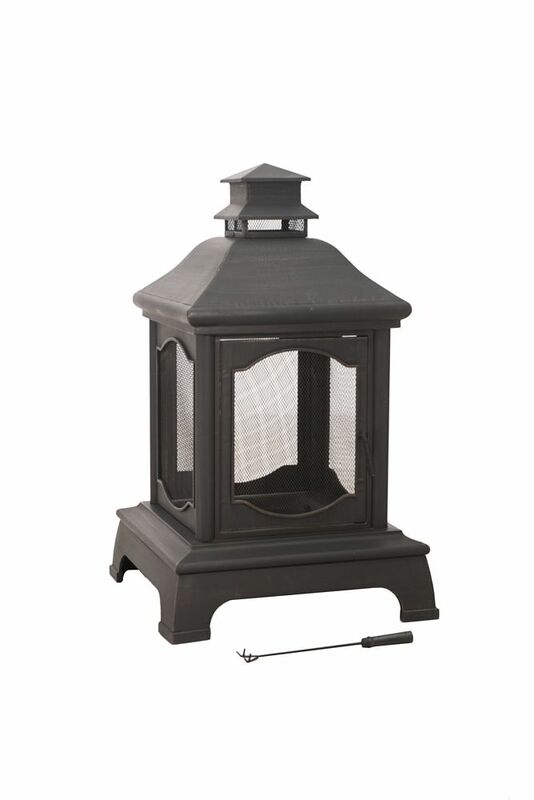 Louise Wood/Charcoal Outdoor Fireplace is rated 3.0 out of 5 by 4. Rated 1 out of 5 by Anonymous from Terrible quality I bought this for my fiancé for Christmas, we live in PA so he didn't get to use it right away... so by the time nice weather came around and we used it for one season and it literally fell apart, the company wouldn't do anything about it because it was past a certain amount of days. Biggest waist of $300 ever. All the screens busted the whole thing is rusted and falling apart. Was garage kept through the winter months. Rated 2 out of 5 by daveinathens from For the $280 price (plus tax), we thought this fireplace was made of rather thin sheet steel and ... For the $280 price (plus tax), we thought this fireplace was made of rather thin sheet steel and would not be rugged enough for our outdoor patio use. Therefore, we returned it for a full refund and will shop for another outdoor fireplace. Rated 5 out of 5 by PappaFrank from A Great Fireplace Easy to put together. Great customer service. I had a chimney with a pretty good size dent when it arrived. I called customer service and within 2 weeks, I had a new chimney at my front door! This thing looks fantastic on my patio and it is easy to clean out after a nice evening fire. My wife and I just love it! Rated 4 out of 5 by Andy from So far very pleased Not too bad to assemble,I've only used it 3 or 4 times so far and very happy at this point , I'm not sure but it apppears to be made of copper didn't realize that but at a couple of places where the black paint is thin it looks like it's copper so I think this might last longer than I thought.